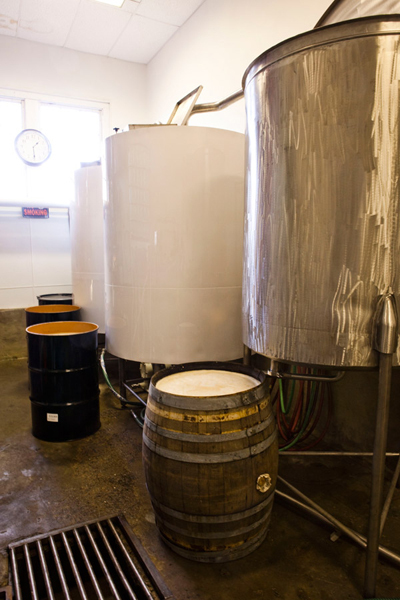 From the very first taste of moonshine, Joe Michalek was hooked. So much so, he made it his passion to learn how to make it himself - from reading books and watching documentaries to talking with the old timers to hear their stories and learn a few tricks of the trade. 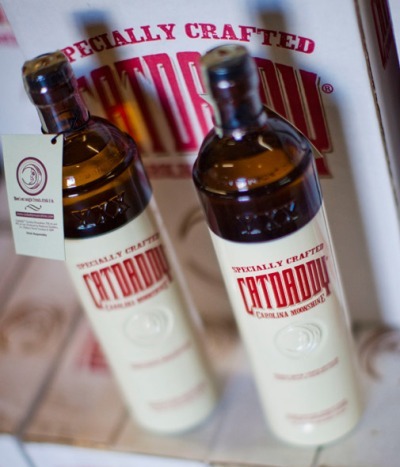 Piedmont Distillers opened in 2005 with its very first product, Catdaddy Carolina Moonshine. As stated on the site, "Catdaddy harkens back to the moonshining days of old, with its corn recipe, secret flavors, copper still and small batch process." Its ingredients are a secret but with a hint of a sweet and spicy undertone, thoughts range widely from fireball candies to vanilla, eggnog, caramel or even Christmas itself. Joe recommends mixing Catdaddy with Irish Creme or eggnog for the holiday. It also works wonderfully in a Manhattan or Old Fashioned. When I asked Joe what he loved about moonshine, he responded, "It's historical relevance. It's America's first spirit. The founding fathers all made it and it is the foundation to all our brown spirits." 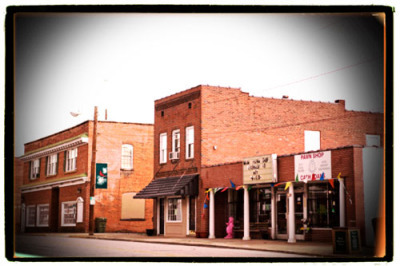 He added with a big smile, "And I've met dozens of moonshiners and they're all characters." One such character is Junior Johnson. 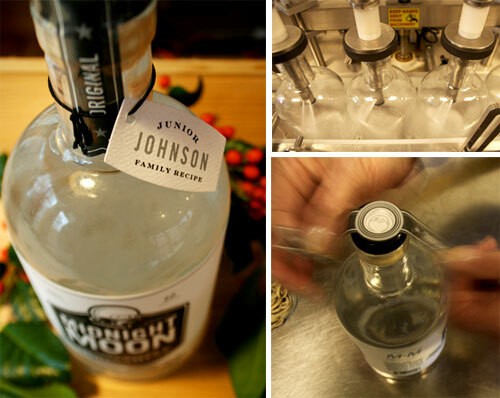 In 2007, Junior became part owner of Piedmont Distillers and helped craft a new flavor, Junior Johnson's Midnight Moon. Now you may remember, Junior Johnson is a famed NASCAR driver from the the 1950's and 60's who perfected his driving skills by running moonshine as a youngster. He became a legend in the South as he was constantly outrunning and outwitting the police to deliver his family's illegal moonshine which was considered the best around. Now, over 60 years later, Junior has teamed up with Joe to revive his famed family recipe and sell moonshine once again. This time, legally, without any worry of jail time. I visited the Distillery a couple weeks ago with my friend Bob. 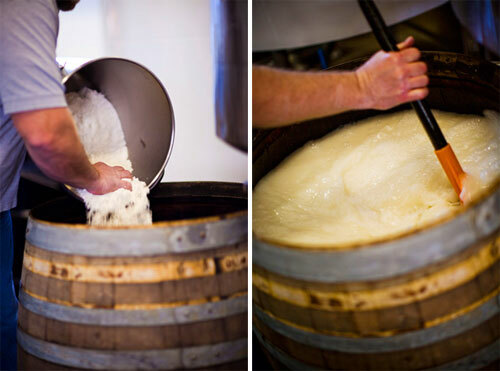 Above is the cornmeal mash that is made over a 3-5 day period and is the first step in making moonshine. Joe was more than gracious to give us a tour and explain the process in detail. Which I mostly forget...All I do remember is that the moonshine is distilled three times for a clean finish, that it derives from a base of fresh cornmeal and there are a lot of particulars with temperatures and vapors and weight to make it just right each batch. The good news is Joe knows all of it! For those who wish to learn more, like my friend Jason who is determined to make moonshine on his back deck, click on their site. The Apple Pie jars have cinnamon sticks in them and each stick is by nature, a different size. 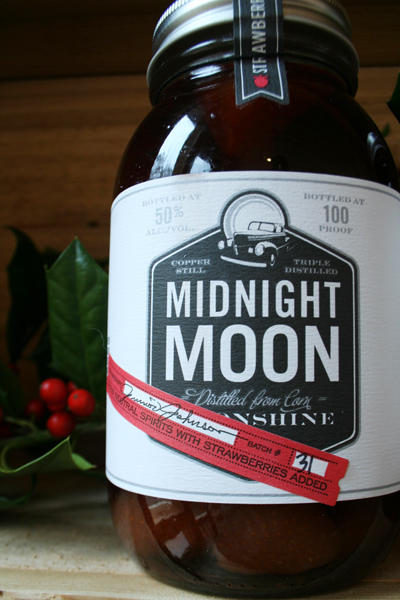 So...if you see a lighter color moonshine, that means you'll taste more apple. If you see a darker color, you'll taste more cinammon. Joe recommends mixing the Apple Pie with ginger ale; the Cherry with Coke, Cream Soda or Dr. Pepper; and the Blueberry, Cherry and Strawberry mix wonderfully with lemonade or iced tea. The best part is Joe is using real fruit in his recipes and keep in mind the fruit is infused with alcohol so be careful. As Joe warns, "You need to respect the fruit, it has a lot of alcohol in it." When I asked Joe to describe his new moonshine in a line or two, he responded, "They are all natural products that taste like real fruit because they are made with real fruit." There's nothing artificial in these jars...but I suppose you couldn't call yourself a true moonshiner if there was. 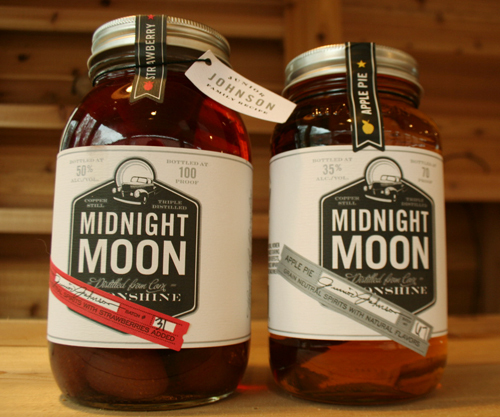 You don't have to live in the South to enjoy the taste of Joe and Junior's moonshine. Their products are currently sold in 46 states. Just click here to find a distributor close by. And take a mason jar of Apple Pie or Cherry moonshine to one of your holiday parties over the next week or two. (or buy as a last minute Christmas gift) I guarantee you, it'll be all the rage... Cheers!